It is almost a surreal experience to wake up in a fancy hotel in Kathmandu, board a helicopter to Phakding, and within three hours hiking in remote Himalayan region. After reuniting with our other team members who flew to Lukla and hiked to Phakding the night before, we all took a quick break for some refreshing lemon & ginger tea at Trekker’s Lodge & Restaurant and posed for an almost obligatory group photo before the official start of our EBC trek as a whole group. While we were on a tea-break, our guides were negotiating for an additional porter for our trip. Our other team had hired two porters from Lukla but we wanted to hire one more to help six of us with our day packs if and when needed. If you are going as a group, I believe its worth the extra expense (approx 1500 Nepali Rupees a day + tips) to hire a common porter for your day packs. In our case, it helped us very much as we all had camera gears and tons of water in our day packs. Our other two porters didn’t like the fact that we hired an additional porter for a “light load” of our day packs and are paying him the same amount (~ 1500 Nepali Rupees per day) as them carrying our heavy overnight duffles. They insisted that they will carry our daypacks (in addition to the overnight baggage) between two of them and asked us to pay them extra instead of hiring an additional porter. Generally, the way it works on the EBC trek is your porters pick up your overnight duffle every morning when you are done with your morning chores and going for the breakfast before the trek. Porters have their own pace and are not with you every step of the trail so them carrying your day pack with your water and other daily needs does not work. On top of that, we didn’t like the idea of them carrying any additional weight. Finally, with the help of our guides, we assured them that we will take care of them by paying additional tips (which we did beyond their expectation!) at the end of our EBC trek and happily resolved the issue. While pulling out my daily needs from overnight duffle (I had transferred some for the helicopter ride) I noticed all the gifts I had brought for the kids so decided to distribute some of it to our group to carry in our day packs. Within no time, I spotted a kid and as soon as I handed out some gifts, he came back running with his friend and then some more! The narrow trail (my Sherpa guide Tshering calls it “Himalayan Highway”) is flanked by shops, restaurants, and teahouses. The shops carry a mix of things for hikers and locals. You can find travel clothes, hiking gears, toys, bottled water, soft drinks (Red Bull everywhere! ), souvenirs, local made jewelry, toilet papers, and so on. During the entire EBC trek, we passed through many towns and I consistently noticed that the towns and the trails were remarkably clean – something I didn’t see in Kathmandu. 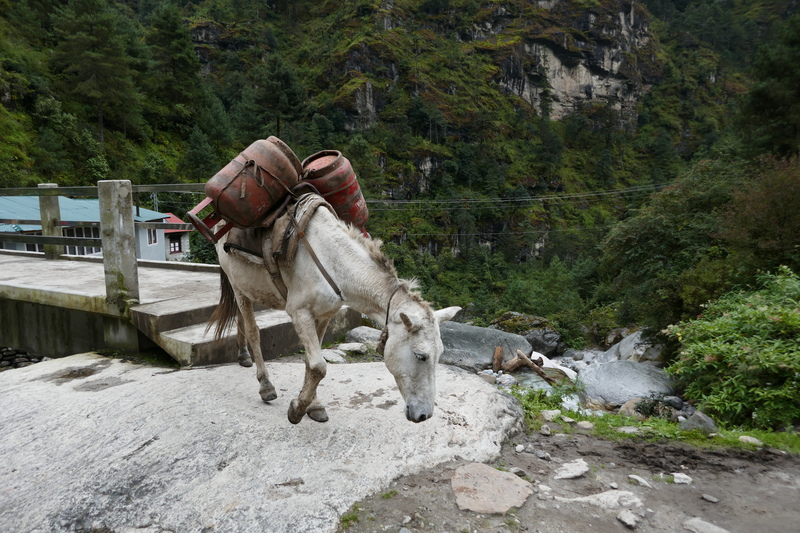 Throughout the trail you see mules carrying full and empty cooking gas (Liquid petroleum Gas – or LPG) cylinders as majority of cooking is done using the LPG gas and Kerosene in this part of the world. Obviously the price of a cylinder goes up (7000 to 12000 Nepali Rupees) at higher elevations due to the transportation costs. Less than half an hour into my first day of the EBC trek, I am on a suspension bridge crossing the Dudhkosi river for the first time. The view of river winding through the valley was magnificent and we all took lots of photos. There are five long suspension bridges over Dudhkosi river on the trail to Namche Bazaar. Throughout the EBC trek, Dudhkosi river and suspension bridges are your constant companion and the bridge entrances/exits provide a nice resting and gathering places for the hikers. At first it may feel unstable to walk on the suspension bridge but after you cross a few bridges, you get used to it and – in my case – I actually enjoyed walking on them! Invariably, most of the hikers stop on the bridge to absorb magnificent views of the river on either sides and take lots of photos. Prayer scarves on a suspension bridge rail. Suspension bridges are adorned with offerings of sacred scarves called “Khada” in local language on the either sides of the rail. My Sherap guide Tshering said they believe tying these scarves bring good luck and success in your travel. I forgot to buy some before the trail but did buy several from Swayambhunath temple in Kathmandu on my way back as souvenir gifts. In addition to the suspension bridges, you will be crossing several other truss style bridges over rivers, streams and other parts of the trail. Generally, entrances and exits of these suspension and truss bridges provide a good resting spots to catch a breath and make new friends. Less than an hour hike after the first suspension bridge, right after passing the Tok Tok town, we came to a beautiful two levels waterfall (like Yosemite fall – but much smaller) right next to the trail. The first two to three hours of trek from Phakding was enjoyable gradual uphill with several vista points. I noticed that I am taking a ton of photos and if I continue at this pace, I will run out of my only one camera battery and storage space. As I mentioned, I had forgotten my camera case with spare batteries and SDHC cards in the helicopter we flew from Kathmandu. I asked Tshering what are the chances of buying a spare battery of my Panasonic Lumix ZS100 as well as SDHC cards in Namche Bazaar. He promised me that as soon as we reach Namche Bazaar, he will take me to a shop owned by his friend. Which he did and to my surprise, I was able to buy a 32 GB high speed SDHC card (suitable for 4K video) for US$40 – not a bad price for that elevation! Soon after passing the water fall, we entered the trail lined with colorful flowering plants on the mountain side leading to a large Buddhist prayer rock, a prayer wheel, and a stupa (known as chorten in Tibetan language). Pretty much everyone stops here to take photos. Soon after that, you enter the Sagarmatha National Park – the home of Mount Everest and a World Heritage Site. There is a small office and a museum where all the trekkers check in. You need a trekking permit to enter the national park – our guides had already arranged it in advance so they registered us while we took a small break. The small green cabin right behind the entrance is a typical check post you see along the trail at major towns. All trekkers must check in and out here. In our case, our guides took care of it throughout the trail. The next stop after this check post is – what we were eagerly waiting for – lunch! We stopped at Bishal Restaurant near a Jorsale for lunch. This was my first meal on the EBC trail and I was dying to eat the famous Dal-Bhat and Tarkari lunch. I had heard a lot about the Dal-Bhat diet while on the EBC trek while researching about the trek before coming to Nepal. As a vegetarian, I am used to eating similar food in my daily life and I enjoyed it when I had it for the first time. After three days into the trek, the Dal-Bhat diet became monotonous and due to the side effects of Diamox (acetazolamide) I was taking from day one, I started disliking it. After our long lunch break (and Doctor’s short siesta! 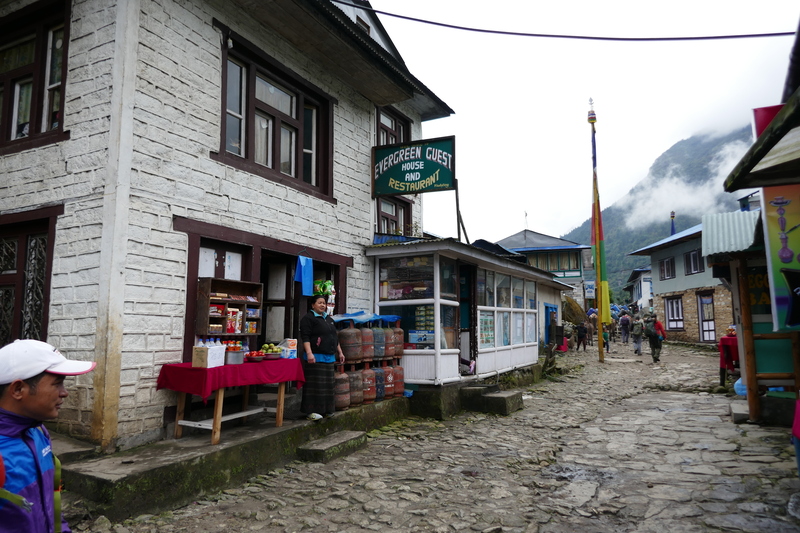 ), we continue our trek towards Namche Bazaar. About an hour later, I see two suspension bridges from the edge of Dudh-Kosi river.These were the highest, longest, and perhaps the most scariest, suspension bridges I saw during the entire trek. I believe I had seen them in some documentary and instantly recognized them. They were quite far and high from where I was standing so I asked my guide Tshering about them and before I could finish my question, he casually said “oh yes we will be going over the top bridge soon”. Soon? I thought it will take me half a day to hike up to the bridge entrance hiding behind the trees on the right side way up there. Tshiring looked at me and said yes that’s the last bridge we cross before we start climbing up the (infamous) Namche Hill on the left side. Here is a picture of the bridge from the edge of Dudh-kosi river. 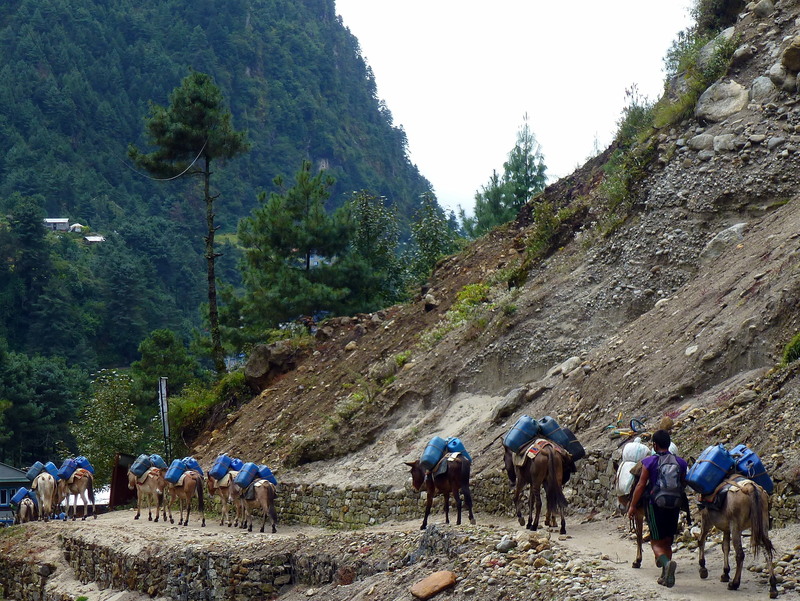 The header image on this page is also the same bridge but in panoramic mode – one of my favorite photos of the trek. Two suspension bridges before Namche Bazaar. Well, we kept marching on and this is when I learned my first Nepali word “Bistari” – meaning slow and steady, from my guide Tshering. Slowly but surely, we made it to the top of the hill at the entrance of the bridge after a very long & steep hike. Several hikers were gathered at the bridge taking photos and resting after a long arduous hike up the hill. One thing is for sure – hiking to this bridge gave me a sense of achievement and much-needed confidence. At last, we are on the top bridge. A view of the lower bridge and Dudhkosi river from the top bridge. If you see yaks or Dzos (Yak-Cow Hybrid) or mules coming from the opposite end, you stop till they pass the bridge or else you will be stuck in the middle of the bridge negotiating your life with the Himalayan beasts. It happened to my and my guide Tshering once when we were in the middle of a top suspension bridge and the fast-moving Dzos (Yak-Cow Hybrid) train approached from the other end leaving us with no choice but to share the Himalayan highway – it was a scary experience videotaped by an Israeli hiker from the other end of the bridge and later sent me the following clip. Is advance knowledge a boon or a curse? Well, it’s a debatable topic. Some people like to know what they are up to in advance so they are better prepared. In my case, I like to know, as much as I could, well in advance, so I am mentally prepared. Perhaps it came from the Boy Scout motto “Be Prepared” from my school days. When Kamlesh, who trekked from Lukla to Phakding yesterday, said that it was a “very tough” trek I started wondering what will he say when we reach to Namche Bazaar tonight. All the research I did before coming to the EBC trek had one thing in common, hike to Namche Bazaar is touted as one of the toughest days due to the 800 meter steep long consistent ascent on infamous Namche Hill. The Namche Hill is at the tail end of the trek, just before you arrive at the town of Namche Bazaar, so you are already tired by the day’s hike making the last ascent even more challenging. So, with these thoughts in my mind we start our final 800 meter ascent to Namche Bazaar. As always, Tshering is constantly reminding me to go slow and steady and after hiking up to the bridge earlier, I had developed a rhythm and a routine of hike/rest so I keep going despite diminishing Dal-Bhat power. Every time I ask Tshiring how far are we from Namche Bazaar he gave me his standard response – about hour and half. Well may be for him but certainly not for me! I kept hiking, resting, photographing and before I realized – I was at a check post with a big sign “Namche Bazaar”. Check post before Namche Bazaar. After passing the check post I was greeted by a beautiful view of Namche Bazaar. Namche Bazaar from the trail entrance reminds me of a giant Amphitheater with hotels and homes nested in semi-circular layers with a buddhist stupa in the center. Our hotel, The Nest, was behind the Buddhist stupa through a narrow path with prayer wheels, not too far from the town entrance. We check into our hotel around 5 pm and call it a day.